US, 2011, 106 minutes. Colour. Taylor Lautner, Lily Collins, Alfred Molina, Sigourney Weaver, Maria Bello, Jason Isaacs, Denzel Whitaker. How far is far-fetched? Pretty far in this case – and a little beyond. After all, two high schoolers taking on the CIA with its top surveillance techniques as well as a European assassin organisation (whose surveillance technology seems to rival that of the CIA – except when they are caught at the end and easily shot down) is not easily credible unless it is in an episode of Spy Kids. After Taylor Lautner’s success as the werewolf in the Twilight series, his fans obviously want to see him in other movies. So, this is a Taylor Lautner star vehicle, aimed directly at the teenage fans. Lily Collins is along for the chase and flight for the male fans. The trouble with the film (amongst many) is that the dialogue is aimed too squarely at the target audience and comes across as banal and sometimes corny with a lot of extra explanation for this who missed it the first time. It illustrates the need for a re-write or testing out the dialogue with an audience. The preview audience began to titter, then to laugh, then to guffaw, with an ironic applause at the end. Had the film just stuck to the far-fetched plot and the chase with minimum dialogue, it would have been more effective. As it is, several top actors appear in supporting roles and some don’t have such good dialogue either. The opening of the film is stronger, with Maria Bello and Jason Isaacs as Taylor’s parents and Sigourney Weaver as his therapist. After Taylor starts a school project with Lily and they look at sites for missing children, mayhem soon overtakes him. Alfred Molina is the CIA investigator and Michael Nyqvist (the central character in Stig Larsson’s Milennium films) turns up as the nasty killer from Serbia. This cast highlights the limitations of the performances of the young couple. 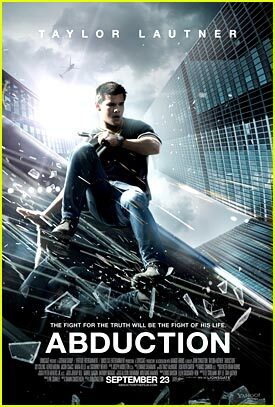 Come to think of it, the film is called Abduction, but it is not really about an abduction at all. Taylor’s fate was no abduction. 1. The title – and the central point not being an abduction in reality? 2. How farfetched the film? Ordinary people, the CIA connection, European assassins, pursuit across the United States? The culmination in the baseball stadium? 3. Nathan, the initial party, Karen and her relationship with Bill, the high school sequences, the aftermath? 4. The father, his interactions with Nathan, fighting him, ruthless, urgin him on, taunting him? Nathan’s reaction? His mother’s love? The domestic atmosphere? Nathan being grounded because of the party? Waking up without his shirt, drinking? The later repercussions of his father’s training him to fight? Going to Doctor Bennett, the therapy, her getting him to relate his dreams? The visualising of his dreams – and the later memories of his mother’s death? 5. The school project, the teacher, Karen and the past relationship with Nathan, his being shy, awkward? Her visit to his house, looking at the websites, the abduction issues, the photo, the phone call, the resemblance to Nathan – and setting off the thriller aspects of the film? 6. The various sites, phoney sites, the video camera, the technology, the assassins and the phone call to London, the assassin and his flight, coming into the US, his being interrogated at border control? 7. Nathan talking with his mother, her going to tell him the truth, calling his father? The fact that he was not their son? The assassins arriving, the confrontation with the mother, her fight, her death? The father and his being shot? Karen witnessing this, escaping? 8. The CIA, the phone call, Frank and his control of the situation? The various members of his staff? Their capacities for surveillance? Frank’s motivation, ambiguous, selling secrets? Organising the pursuit? 9. Doctor Bennett turning up, her car, in the hospital with Karen, the escape, Doctor Bennett causing the diversion, Nathan and Karen going into the cold night, in the river, sleeping out, the address from Doctor Bennett, finding it, the apartment, the phone, the money? Escaping? 10. Going to the train, getting on board, the assassin and the surveillance, the connections, seeing the youngsters on the train? The capture of Karen? Nathan and his search for her, the fight, throwing the assassin out of the train? Their escape? The helicopter and Frank’s arrival? 11. The killer, ruthless, his pursuit, his associates, his motivations, Nathan’s father and the stealing of the information? 12. Frank, finding Nathan and Karen? At the burger restaurant? The guards? The ambush and the killing of the CIA agents? 13. Nathan and his plan, realising that the information was on his father’s phone? The baseball setup? His school friend and the past with his faking cards? Bringing the tickets to Nathan? Karen waiting, photographing the assassin? Nathan meeting the assassin, sitting in the stand, the game going on, the assassin not understanding it? Nathan and his luring the assassin out, his father’s phone call, the gun, the shooting outside? 14. Frank, the authorities and the previous briefing, Frank and his self-justification, his being arrested? 15. The sitting and talking in the grandstand, Karen and Nathan – the intimacy on the train, the memories of the past, their future? Staying with Doctor Bennett? 16. The target audience, Taylor Lautner and Twilight? The screenplay written for the younger audience, failing for an adult audience?